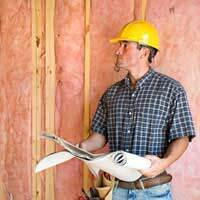 Any extension will need insulating and with the emphasis these days on energy saving as part of an ecology and cost drive, more attention is being paid to insulation that ever before. And it's not just the energy-saving capabilities of insulating materials that are attracting attention but the ecological sensitivity of the materials themselves and their production. Assuming that part of the extension is brick-built or similar in construction, then there should be a cavity between the inner and outer layers of the wall. This would almost certainly be filled with traditional mineral wool insulation, the same stuff that goes into lofts. There are alternatives that are more ecologically sound if you are that way inclined, such as sheep's wool or mat made from recycled material. These other options can be used for loft insulation too, if your extension has a pitched roof. If you have opened that loft space up though, to give a light airy feel to the new part of the home, then the insulation has to go directly up against the roof slates or tiles, and then be covered from the underneath with ceiling boards, plasterboard, or a similar solid layer. If you want the beams and joists to be exposed this can limit you to a thinner layer, but there are space-age insulating boards available, some with foil coatings, that give the same insulating properties for a third to a quarter the width, but are of course a lot more expensive per square metre. Windows will need attention, and of course double-glazing makes complete sense, even triple-glazing if there is a vast expanse of glass in the extension. With a conservatory, especially a fully glazed one rather than one with dwarf walls, keeping them warm is very hard, as a lot of heat is lost through windows. Of course a new conservatory will almost certainly be double-glazed but there are other glass treatments that can help absorb more solar rays and reflect heat back in so enhance the effect. If you are building a conservatory and expect to be able to use it all year round, then a dwarf wall will help in two ways. Firstly the lower quarter to a third of the structure can be constructed from a double layer solid wall, with the cavity filled with insulation, so the overall insulating properties of the room will be much better than it if were glazed from floor to ceiling. Secondly the wall provides a place for radiators to stand against, whereas they would look odd mounted against a window. In fact, if possible, underfloor heating would be the best option for a conservatory. As well as the more consistent coverage of heat it gives you, with fewer cold spots, the temperature of the fluid is only 45-55 degrees as opposed to the 85-95 of conventional radiators, so it requires less energy to heat the room. Finally, don’t forget the floor too. Although heat rises, making walls, roofs and windows the top insulation targets, having a cold floor will mean the time taken to warm the room up will increase and that in itself will waste energy. As building the extension will almost certainly involve laying floor bases and floor coverings, it makes sense to spend some time and money choosing and laying down an insulating layer between them while you have the chance.